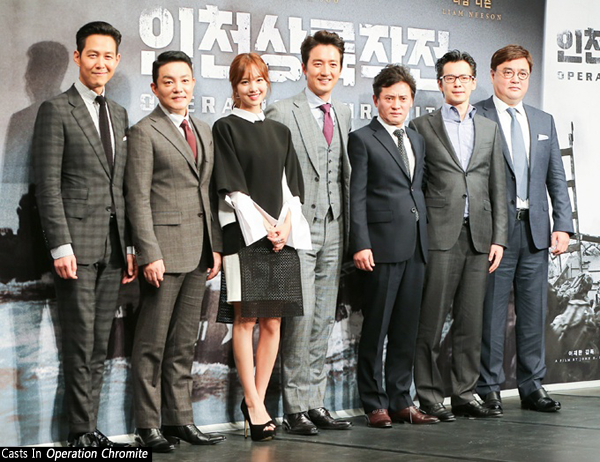 The upcoming Korean War blockbuster Operation Chromite has filled out its main cast, introducing a number of its local stars during a press conference held in Seoul on October 30th. Joining Hollywood name Liam Neeson and previously announced local actors LEE Jung-jae and LEE Beom-su will be JUNG Joon-ho, KIM Byoung-ok, JIN Se-yun and Korean-Japanese MMA fighter CHOO Sung-hoon. John H. LEE is helming the large scale film for TAEWON ENTERTAINMENT, which will tell of the Battle of Incheon, a military operation that served as a turning point in the War for UN forces. JUNG, star of the Marrying the Mafia and My Boss, My Hero franchise, will appear as a South Korean military figure while KIM, who famously played YOO Ji-tae’s white-haired bodyguard in Old Boy (2003), will play a barber with a key part to play in the story. New actress JIN is set to feature as a nurse, and CHOO, in his first ever film role, has been cast as a North Korean soldier.